Photo courtesy of the Westport Charter Boat Association. 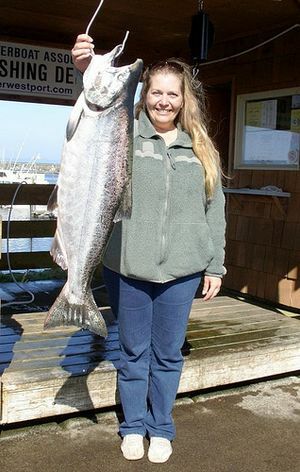 The Washington Outdoor Women (WOW) is hosting a Fall Women’s Weekend Workshop to learn the basics of fishing, hunting and other outdoor skills on Sept. 16-18 at Camp Waskowitz in North Bend. The workshop coordinated by WOW, a non-profit program dedicated to teaching women outdoor skills and natural resource stewardship, targets getting women ages 18-and-older for a weekend of outdoor education and fun. More than 21 different classes taught by 28 instructors will be offered throughout the weekend, including archery, basic freshwater fishing, fly fishing and fly tying, bee keeping, soap making, birding, fire building, camping, hunting and tracking, Dutch oven cooking, map and compass, wilderness first aid and survival skills. Cost is $275 for one adult includes the weekend’s instruction, lodging, meals and use of all necessary equipment. Partial Scholarships available from the Rocky Mountain Elk Foundation. Registration deadline is Sept. 9 or sooner if event workshops fill up. To learn more about the workshop and to download the registration form, visit http://www.washingtonoutdoorwomen.org or call Ronni McGlenn at 425-455-1986.